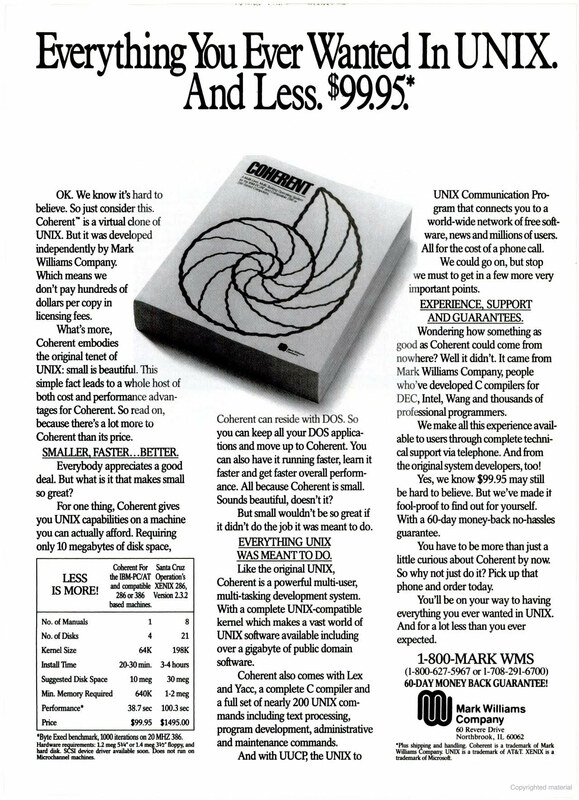 Now even if you want to you can’t wind the clock back to the late 1970s, but Unix lovers can do the next best thing-pick up a copy of Mark William’s Coherent for $99.95. Included in this time capsule are all of the utilities that you would have received in an AT&T Unix, Version 7, distribution circa 1978. The package includes a protected-mode multi-user multitasking operating system. over 150 utility programs, a C compiler, an assembler, software development tools, text formatting tools, system management tools, telecommunications utilities, and complete documentation in a very hefty, 1,000-page, perfect bound book. Most of the Unix classics-grep, ed, sed, awk, lex, sh, emacs-are there as well. The only favorites that are missing are vi (which is a text editor) and Dave Korn’s new shell. Whether Coherent’s views on the Unix system match your own is a matter of taste. In the halcyon late 1970s, the Unix system was a relatively simple affair-lean and clean, and understandable to mere mortals. Since then, in an effort to make Unix the universal solution, countless features and versions have been grafted onto it by innumerable programmers, managers, committees, and boards of directors. The result stands in stark contrast to the stated goals of Unix’s inventors. Coherent remains true to Unix’s roots and eschews local area networking, graphical user interfaces, menus, mice, and many of the other amenities that present-day DOS users and Unix users have come to expect of modem software. Coherent’s installation is painless, but only after the agony of freeing up a 7MB or larger partition on an ordinary MFM or RLL disk, on a classic AT architecture machine. Since they are products of the modem era, ESDI and SCSI disks, as well as IBM’s Micro Channel architecture are not supported. Graphic display adapters are tolerated (used in text mode); mice are not supported. Coherent worked flawlessly, though, on my geriatric AT clone. DOS software from within the Coherent environment. Mark Williams’president Robert Schwartz explained that the intended audience for Coherent are people who want to learn about or try the Unix system, without the hefty price tag and steep learning curve of the latest Unix versions. Part of Coherent’s advantage in both simplicity and price stems from its origins as a privately developed “clone” product-therefore no AT&T requirements need be met and no per-copy royalty is paid to AT&T. This gives Mark Williams the freedom to set prices as well as compatibility targets. But learning Unix from Coherent would be a bumpy road. You could certainly master traditional system administration, learn the utilities. And experiment with Unix software development. But you couldn’t learn about networking or the increasingly important X Windows system. Nor could you realistically use Coherent to automate a small business. Schwartz promises that future versions of Coherent will support 32-bit operation on the 386, and will likely support tighter integration with DOS, some form of window manager. And local area networking. When that occurs, Coherent will be much more like modem Unix systems and, like modem Unix systems, it will have strayed far from its roots. List Price: Coherent Version 3.0, $99.95. Requires: A free 7MB or larger hard disk partition, 640K RAM, highly disk drive, MFM or RLL controller. Mark Williams Co., 601 N.
And then it seemed to my teenage eyes something pretty underwhelming. 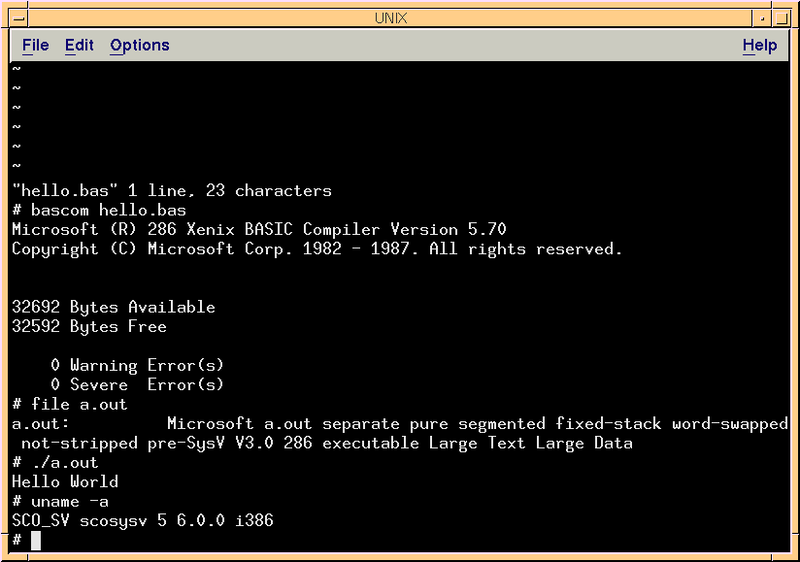 So I dove into OS/2, and ignored the idea of having a UNIX like system. I was still happy to finally move onto a 16-bit machine, and the thought of running stuff from the 1970’s wasn’t that appealing. Such missed opportunities. But in the last few years, Coherent has been placed under a 3-clause BSD license. 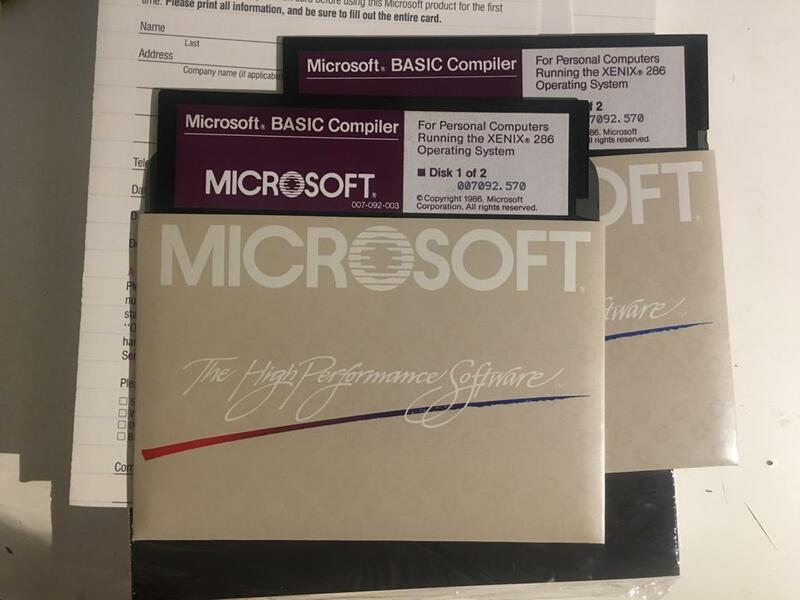 Over at unix4fun, they did unearth some version 3.0 disks! 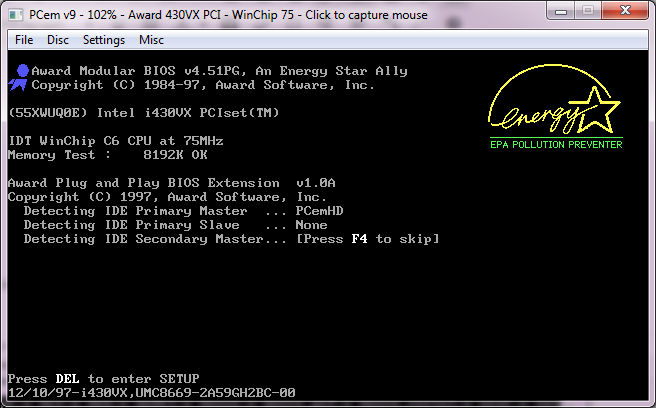 And yes, it’ll install on PCem/86Box using a 286/386/486 machine. One issue I had was I first tried to install onto a massive 40Mb disk, and it never would reboot after the install correctly. However it works great with a 32Mb or smaller disk. As you can see from Kaare’s review it’ll fit into 7MB of disk space! At least having to either re-partition or worry about dual booting is a thing of the past. The disk images are 5.25 disk images, so re-configure your VM appropriately. As the advertisement says, the installation is a mere four diskettes! 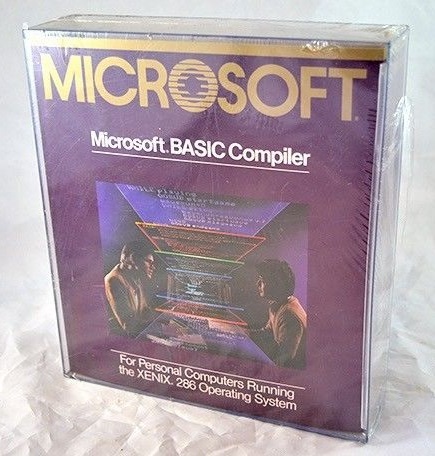 And yes, it really does have a C compiler. You will need a serial number for Coherent 3.0, which took a while to find, but Peter had one, and has been poking me for the last week+ to finally write this up. Oh the number is 130500000. 305/Miami connection? Unlikely, but who knows. Don’t forget to download the hefty manual, Coherent_Revision_8_1992, which is for a later version, but still suitable. And yes, it feels just like Unix v7. The kernel is tiny, 77kb! It’s really cool for 16-bit era stuff, and really interesting to knock around. I know there is a few more people out there that want fun things for their 286, and Coherent will certainly scratch that itch. Additionally on the site are the 3.1 and 3.2 updates to give you thinks like Elvis so it doesn’t feel anywhere near as primitive. Installing updates and 3rd party packages is covered on page 736 of the manual, or in short you need to know the magical ‘disk set name’ for everything you want to install. I suppose back then it had stuff like this printed on them. While a ‘dump’ of the source code has been out there, I haven’t really gone through it, so I thought now would be as good as any to take a look at the kernel. The layout is very similar to v6, so I based this on the file ‘sys1.c’ which appears quite a few times in the trees. Using a MD5 checksum against the files there appears to be no less than 17 duplicated tress or 7 unique kernels, spread over three years. Phew! Naturally the tree structure drifted, but I went ahead and just did a blind import into my CVS server to take a look. And there really does appear in the 1991 versions to be the remnants of either 2.3.37, 3.2.1. It’s hard to say. injecting networking was no more difficult than it was in version 10. It’s only a few changes to pc.c, if you look at the USENETWORKING define you’ll see them. The best notes are on the forum. I haven’t changed or improved anything it still requires manual configuration. 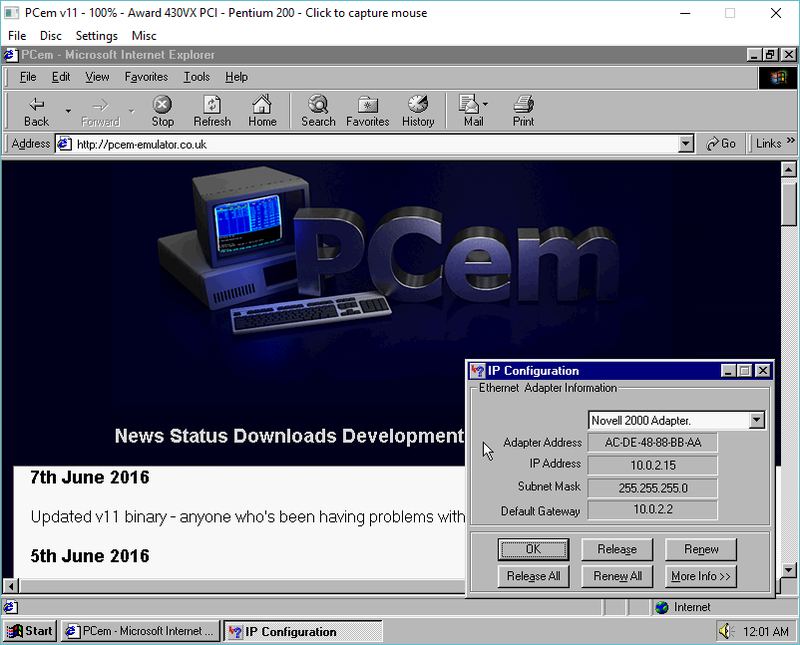 Downloads are available on my site as pcem_v11_networking.7z. You’ll have to defeat the password protection, as always. I included the source, it ought to be trivial to rebuild. *For anyone using an old version the ‘nvr’ directory is missing, so PC-em is unable to create new non volatile ram save files, meaning you always loose your BIOS settings. Sorry I missed that one. I haven’t had time to follow it, but great news! Thanks to Battler, SA1988, leilei, Greatpsycho, John Elliott, RichardG867, ecksemmess and cooprocks123e for contributions towards this release.  Downloads are available for Windows & Linux. 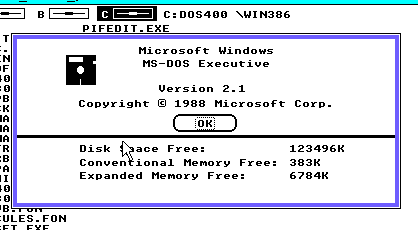 I know what you are thinking, wouldn’t it be great if you could create MS-DOS executables directly from a Win64 desktop with no MS-DOS needed? Well, I just found out about this unofficial Open Watcom v2 project that targets the usual suspects, allows you to compile from Win64! 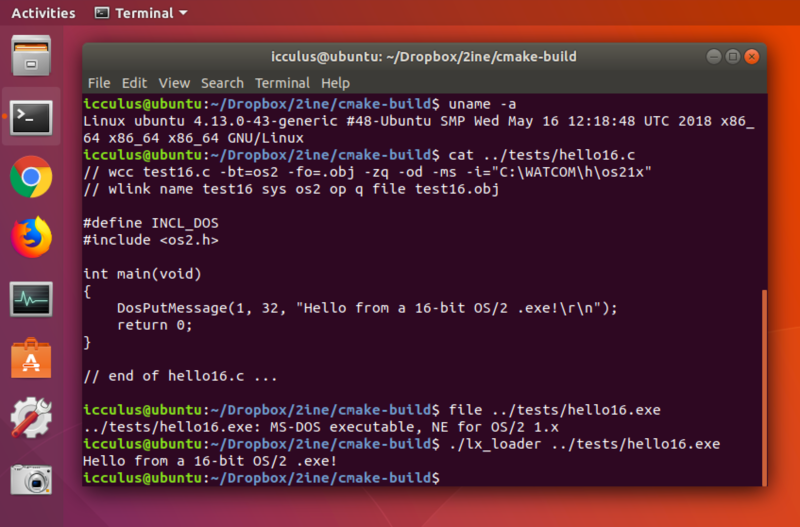 Binaries are available on sourceforge. The C++ compiler now treats warning W737, implicit conversion of pointers to integral types of same size, as an error. Which is an integral part of wl_menu.cpp . 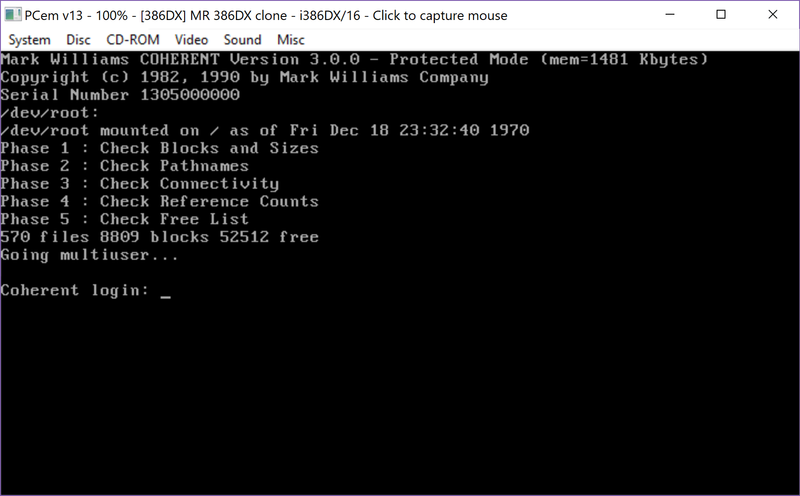 So this was somewhat problematic, until I just commented out that block, and while I was expecting no working keyboard, I’m able to play, and load/save games…. Even the boss key works. So with the W737 taken care of, I have to say this thing compiles FAST. Incredibly FAST. If for some reason you have to build 16bit or 32bit anything, you should look at a 64bit tool chain, well assuming you have a 64bit computer by now. If anyone want’s to build their own Wolf4GW with the newer OpenWatcom, my source drop is here.